I love a good crumble. Honestly, other than pie, this is my favorite kind of dessert. 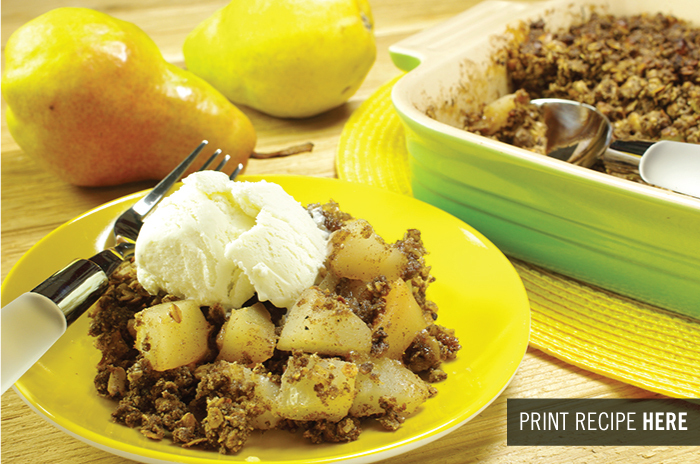 Warm supple pieces of fruit surrounded by maple, oats, walnuts, and butter – need I say more? Maybe just this: this is about the easiest weeknight dessert you can make. Your kids will be grateful too. PREPARING TO BAKE. Preheat the oven to 375°F. PREPARING THE PEARS. Cut the pears in half. 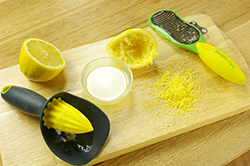 Peel and core them. 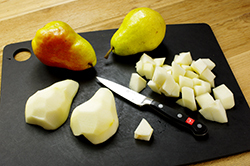 Cut each pear half into 5 slices lengthwise, then dice them the other way. MAKING THE FILLING. 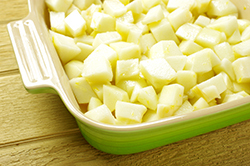 In a 9-inch pie pan, combine the diced pears, 3 tablespoons of the maple syrup, the orange flower water (if using), lemon juice, and lemon zest. Set aside. TOASTING THE OATS. Set a small skillet over medium-high heat. Toss in the oats. Cook, flipping the oats in the pan occasionally, until they smell toasty, 5 to 10 minutes. MAKING THE TOPPING. Put the walnuts onto a cutting board. 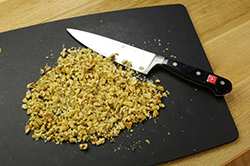 Using a sharp chef’s knife, chop the walnuts until they are very small pieces. 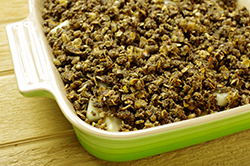 In a large bowl, combine the tasted oats, chopped walnuts, flour, and cinnamon. Add the butter. Work the butter into the flour mixture with your hands until the mixture is crumbly with some visible butter chunks. Drizzle it with the remaining 3 tablespoons of maple syrup and work that in. Plop the crumble topping over the pears in the pie pan, distributing it evenly. BAKING THE CRUMBLE. Bake the crumble until the pears are knife-tender and the edges of the crumble are bubbling with hot juices, about 45 minutes. FEEL LIKE PLAYING? If you can’t eat oats, even certified gluten-free ones, try quinoa flakes here. If you can’t have nuts, try sunflower seeds, pulsed a bit. If you can eat nuts, we think hazelnuts would be wonderful here too. 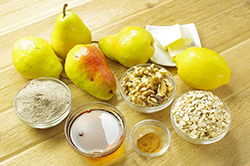 Mix pears and apples together for even more warmth. Orange flower water is the baker’s secret weapon. Just the tiniest splash makes desserts like this mysteriously good to the people who eat it. “What is it? Why is this so good?” You’ll hear them ask. You’ll just smile and be grateful for that bottle of orange flower water in your pantry. More and more, I use this mix when I’m baking. Not only do I appreciate the health benefits of whole-grain baking over starchy flours, but I also love the flavors of whole-grain flours. Buckwheat has a gentle nutty taste. Teff has a faint taste of chocolate and molasses. Millet has a neutral taste, so it plays well with others. Amaranth is grassy. Quinoa is deeply savory, so it’s great in quiches. Garbanzo flour tastes like . . . garbanzo beans. Oat flour tastes like oats. 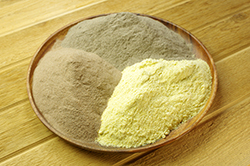 When you mix whole-grain gluten-free flours, you can really build flavors with flours. This is brand new for baking. Most people aren’t thinking about flours as a flavor builder. But when you taste the chocolate chunk cookies with teff flour and hazelnuts in this cookbook, you’ll understand why. Simply combine the flours in equal parts by weight. Again, you can switch in the ones you want. I can tolerate gluten-free oats, so I use oat flour often, particularly in breads. 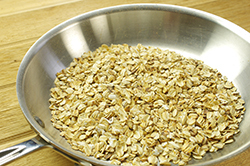 Many celiacs cannot tolerate oats, however, which is why I don’t recommend them in the basic recipe. I prefer the taste of raw buckwheat groats ground into a flour over toasted buckwheat flour. However, if you don’t want to grind your own flour, skip the buckwheat and switch to sorghum instead. And that’s it. Again, mix them all up in a large container and keep it on your counter. Whenever you want to bake, simply pull the flour container toward you and pullout the scale.